not a lot to ask for I should say! So here I am, 39. Living in a cute, but rather small, magic place in the middle of a sunflower field in southern France. Looking to buy a house and looking forward to a somewhat different life to lead. Sometimes I think of what most of my female friends my age are doing at the moment, not being able to make too many crazy moves while raising their kids; an all consuming period of their lifes. How different that is from the road that I took. Perry and I have been "on the move" for almost 2 months now and we are still looking for the place that will be our home. In the meantime I feel happy in our 35 square meters living/bed/dining room, all in. It is not warm in the little house, we are amidst our moving boxes filled with necessities, but the environment is so beautiful, I can't complain. 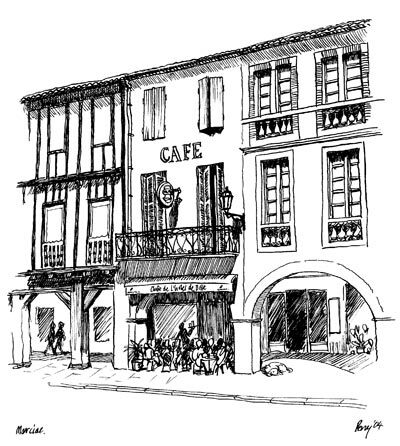 Café l'Hôtel de Ville in Marciac.